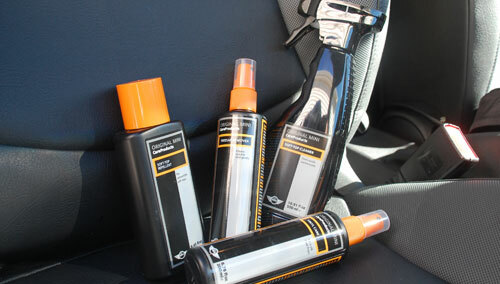 Sometimes there's something nice about using MINI branded car care products- espcially when it comes to the convertible top on your beloved Mini.. Not only are they specially formulated for the exact fabrics and materials on the MINI Convertible Top, they are easy to use and work well. - Cabrio Soft Top Cleaner - 16.91 oz. Use to clean the top when you wash the rest of the car. - Cabrio Soft Top Repellent- Helps keep dirt, and other particles from settling into the fabric. - Vinyl Care- 6.76 oz. For deep cleaning all interior and exterior plastic.